Dimensions: 7.75" x 5.5" x 6.5"
The Paasche Airbrush company specializes in manufacturing airbrushes, airbrush air compressors, and spray booths. It also sells various equipment and accessories related to these products. For decades the Paasche company has been one of the major manufacturers in the production of art supplies. Paasche airbrushes and compressors have earned a good name thanks to their reliability and working capacity. Artist Supply Source offers you a wide assortment of Paasche products for painting, tattooing, and other hobbies at affordable prices. Shop our items to find the best option for your needs. The Paasche STS-1S tanning set comes with a single action airbrush, an air compressor, an air hose, two plastic bottles and one pint of tanning solution. This kit provides fast and evenly coverage so you'll be covered with tan less than in five minutes. Moreover, the airbrush applies a thin layer of tanning solution providing a high-quality application even at low pressure. 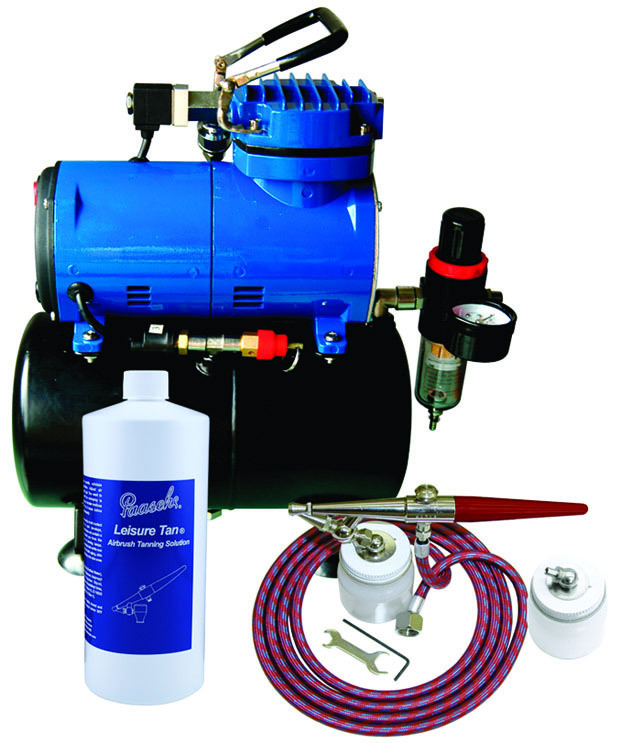 Paasche D3000R air compressor also includes a tank, a regulator, a moisture trap, and a hose adapter. All parts are durable so metal details won't crack or break even after several months of a repeated use. As a result, you'll use this tanning set for a long period of time and enjoy the tanning process. The Paasche D3000R airbrush compressor is perfect for all kinds of hobbies, including modeling, illustration, and painting. It is silent which is an important aspect of a finicky job. Besides, the unit has the auto shutoff that switches the compressor off when you don't use the airbrush. Also, the auto shut off function prevents the tank from overheat thereby increasing its durability. The storage tank helps to cool down the air and avoid spitting during the spraying process. Thus, the air stream flows smoothly without squeaky or wheezing sounds. Additionally, due to the compact and portable design, the item takes up little space so you can put it into a bag and take it anywhere. The maximum operating pressure in the tank is approximately 40 PSI depending on an airbrush. The automatic on/off switch regulates the pressure and turns the compressor off when the air pressure reaches its maximum. The sturdy storage tank controls the air volume and reduces pulsation during the compressor use. The D3000R features a 1/8 HP motor that operates on 120 Volt, a 1/8 BPS hose adaptor, and a six-foot electric cord.